Archbishop Benjamin was born in 1954 and was baptized and chrismated at Holy Virgin Mary Cathedral, Los Angeles, CA on April 27, 1972. In 1982, he was awarded a Master of Divinity degree and Certificate in Liturgical Music from Saint Vladimir Seminary. A prolific musician, he served as choirmaster at parishes in Detroit, MI and Los Angeles and as chairman of the Orthodox Church in America’s Department of Liturgical Music. He was ordained to the Holy Diaconate on November 15, 1987 by Bishop Tikhon at his home parish, which he served for 10 years as deacon and youth and education director. The following year he was tonsured a riasophore monk by Bishop Tikhon and further tonsured to the lesser schema by Archbishop [now Metropolitan] Herman at Saint Tikhon Monastery, South Canaan, PA. In 1991, he was elevated to the rank of archdeacon. On July 19, 1997, he was ordained to the Holy Priesthood by Bishop Tikhon. In 1999, Igumen Benjamin was transferred to the Diocese of Alaska, where he served as dean of Saint Innocent Cathedral and later as administrative dean of Saint Herman Seminary, Kodiak, AK. He was elevated to the rank of archimandrite in 2002. In January 2004, he was reassigned to Holy Virgin Mary Cathedral, Los Angeles, and appointed Chancellor of the Diocese of the West. 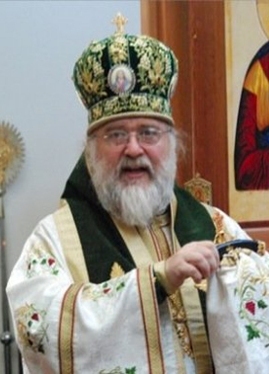 Archimandrite Benjamin was elected to the episcopacy by the Holy Synod of Bishops at its Spring Session in March 2004 as Bishop of Berkeley, Auxiliary for the Diocese of the West. His Beatitude, Metropolitan HERMAN presided at the consecration of Archimandrite Benjamin [Peterson] to the episcopacy at historic Holy Trinity Cathedral on Saturday, May 1, 2004. Following the retirement of His Grace, Bishop Tikhon (Fitzgerald) of San Francisco, Los Angeles and the West in November 2006, a diocesan assembly nominated Bishop Benjamin as ruling hierarch on January 31, 2007. The Holy Synod of Bishops canonically elected him as Bishop of San Francisco and the West in March 2007. He was installed as ruling hierarch of the diocese on October 2, 2007. In addition to overseeing his own diocese, he provided archpastoral leadership for the Diocese of Alaska as its administrator in 2008-9 and as locum tenens from 2009 until early 2014. He was elevated to the rank of Archbishop on May 9, 2012.